Cam and Francis (a long time ago). Francis Chan is a fascinating figure. Since I’ve been following him, he’s went from megachurch pastor to missionary to house church planter. For awhile, he was everywhere. He was speaking at major conferences all over, writing books, and preaching at his church in Simi Valley most weeks. Then, he dropped off the planet for awhile. Let me begin by saying that I have a special place in my heart for Francis Chan. 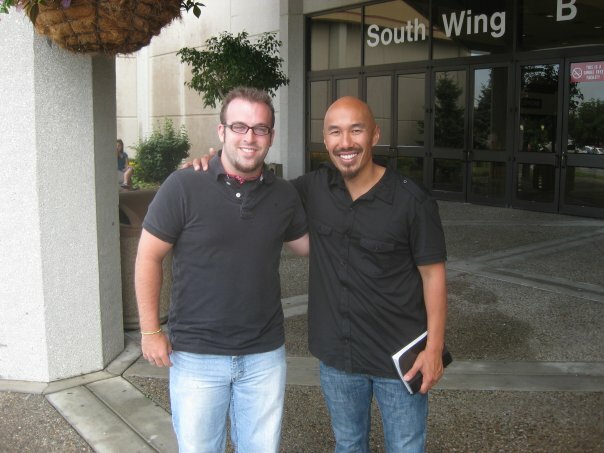 Back before podcasts had really taken off and I still had a small, white iPod with a black and white screen and a touch wheel, I was downloading Francis Chan’s sermons each week and listening to them as I mowed my parents yard. I was going to a church where II didn’t feel like the Sunday sermon was feeding my soul so I listened to Chan weekly and God used Him in great ways to challenge and grow my faith. He almost felt like my pastor. I was sad when I couldn’t hear Him weekly after He left His church. In Letters to the Church, Chan details much of his family’s journey through this time of transition and he shares what he has discovered. Much of the book is very engaging and challenging. Many Christians would do well to read and be challenged by the majority of the book. However, I wish the latter part of the book came with a warning label. Let me explain. Chan has great zeal and passion for the Lord. This is one the things that makes him so engaging and challenging at the same time. Crazy Love flipped a lot of people’s world upside down (mine included). Chan delivers much of that zeal and challenge toward what we would call the traditional church model here. A lot of it is needed in our western culture where many churches are striving for entertainment rather than equipping the saints. He advocates for a return to what we see in the Bible: reading, teaching, and preaching the Scripture, singing, prayer, and communion (I think he should’ve also included baptism). I think this is very needed. Chan seems to think to return to this, the best way is through house churches and he goes on to explain in detail the way his church planting movement is doing it. This is where we need the warning label. In advocating for the house church model, Chan makes it seem like the absolute best way. He lays out all of the advantages and makes it seem all very romantic. Now, there definitely do seem to be advantages to this model, but Chan gives none of the troubles or disadvantages. He does say, “We have plenty of problems, but there is plenty of life” (191). However, he does not say what any of those problems are. This is where I think the book becomes unbalanced and even dangerous in the wrong hands. Here are two that immediately jumped out at me. First, Chan very much seems to downplay formal theological education advocating instead for discipling elders who disciple elders. This could work… if your starting point is Francis Chan (who was formally theologically trained). In downplaying seminary, Chan invites all kind of error into house churches that may seek to replicate what he’s advocating for. The Holy Spirit is fully capable to teach those reading His word, but many errors have crept into many denominations and sects of Christianity because those who started the movements didn’t know how to rightly handle Scripture. This could result in many churches springing up that are built on heresy or false doctrines. Second, some of Chan’s statements may not find biblical grounding. He advocates that the house church is the biblical model. Yet, we know at least 3,000 men were converted at Pentecost. Did they all wind up in house churches or was there a larger gathering? I’m not sure we have clear evidence. We also know Paul’s letters were circulated to churches in different cities. Colossians 4:16 says, “And when this letter has been read among you, have it also read in the church of the Laodiceans; and see that you also read the letter from Laodicea.” Paul at least makes it sound like the church gathered together in one place to hear the letters read. Either it was a very small group of people that made up the church or they gathered in a large gathering. The Bible also makes it clear there were churches in homes (1 Cor 16:19, Col. 4:15, Philemon 2). Our emphasis should be on the church as a people, not a place. To be clear, we need this balance so average church members don’t pick up this book, rush into their pastors offices, and say, “We’re doing this wrong! I’m going to start my own church.” Chan warns against this somewhat in the afterword (which many people don’t read), but also he could alleviate it if he would’ve at least been transparent about some of the weaknesses of the house church model and strengths of the traditional one. Chan also advocates for a bi-vocational pastor model meaning that pastors work secular jobs and aren’t paid by the church. As someone who has done both, this has strengths and weaknesses. Someone who is bi-vocational does have opportunity to frequently engage those far from Christ. They also don’t have as much time to prepare for teaching, preaching, and ministering to their congregation. It also frees up more money for the church, but the Bible does seem to advocate for paying pastors (1 Cor. 9:14, 1 Tim. 5:18-18). Ultimately, I think Chan has said a lot of good things in this book. However, I think if he had said a little more regarding strengths and weaknesses it could have provided some protection to pastors and churches. I would advocate for people to read Letters to the Church, but let this be a warning label to read with caution.